The magic lantern has been around for 350 years. This little glowing box that threw pictures on screen was one of the world’s most important ways of sharing images. It lived on the backs of travelling entertainers, and in the mahogany parlours of wealthy scientists, it was shown in palaces and pubs and is still with us today. 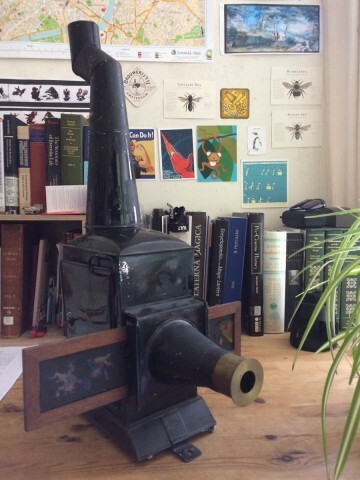 A magic lantern is only a projector—a light-sealed chamber with an illuminant inside and a series of lenses—and it fell into lots of unexpected places. The 1960s carousel slide projector that your granny showed her holiday snaps on was a magic lantern. Those little cardboard smartphone projectors are magic lanterns. When you give a powerpoint presentation, you are giving a magic lantern show. A motion picture projector is just a magic lantern with an extra mechanical (or digital) contraption. There are still literally tens of surviving lanternists, scribbling out shows at the margins of popular culture, as they had in the eighteenth century. But things have changed a little bit. I am a historian of technology. My job is to find life in the discarded machines of the past and show how these long-broken mechanical trinkets once changed the world. Not only for scientists and engineers—I mostly do not care about the rich inventors—but for everyone. I care about how technologies flitted around the everyday world and changed how people lived. The lantern was an exemplary everyday technology. It was the machine that people used to talk back to a changing age of machines. So I started to give lantern shows. First, this was because I was giving papers and lectures anyway and it made little sense to use a digital projector. I bought a mid-nineteenth century Phantasmagoria lantern and fitted it with a simple electric light. I stumbled about picking up the odd slide here and there, trying to get the right ones, from the right era, making do with the stories and pictures I found, twisting my material to fit them. 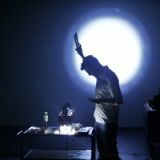 I gave lantern performances in Durham, Bradford, York, and London. I took it to conferences and didn’t tell anyone until I started. I once presented a paper with a lantern at Cambridge. I sang a streetseller’s song about Lavender and claimed, in broad Geordie, that my family were street performers going back to the sixteenth century. I told a falsified history of working-class technology, called the middle-class historians liars and chauvinists, and no one challenged me on my methodology. I love the lantern as a mode of speaking because it authorises you to break rules; because no one today quite knows what it should be for. This is the recurring problem of the modern lanternist. There are different perspective on what constitutes an ‘authentic’ lantern performance. Some people give very grand, technically sophisticated shows to reveal how complex and marvellous it was. Others give low-fi, comic performances, riffing on their own awfulness and the limitations of the apparatus. Some shows are informative, most are hilarious, and often the biggest shock is just seeing the beauty of the images. There was never one single style. The lantern tunnelled into so many different contexts. It has been everything. I do not always care for the grand lantern shows or the bumbling comedians. They too often rest on false assumptions of victorian splendour or historical stupidity. The very best shows I have seen used these old technologies to do something new. Last year I saw an artist perform an underwater lantern-shadowplay-puppetshow as a fake 1960s documentary about ocean life. It was virtuosic and hysterical and had moments of terrible beauty. A Victorian lanternist could never have channelled an ecological zeitgeist so well. And so I have tried, in my own fashion, to build a mixed-media lantern performance that is a history of the medium in its own time, at the turn of the nineteenth century, when new machines and new social structures were changing everything. I begin as a standard historical voice, but slowly slowly I let this slip into my natural voice, minor accented, angry, slightly too fast, tripping over itself, speaking back to the historians from below. I want to use this machine to pick away at the history of technology; to show how the stories of inventors and factory owners and brilliant men were always dubious. My research shows how the labour of anonymous workshop networks powered the birth of new technologies and new media. We often paint the lantern as a middle-class toy. But it had teeth. It was a machine that spoke back to power. In the eighteenth century there were thousands of travelling lanternists presenting satires on the rich and critiquing the major political events of the day. One of the slides I use is Pull Devil Pull Baker, the most famous of its day. This tells the story of a crooked baker who, having been caught fixing his scales, is dragged to hell. This can be interpreted as a simple morality story (and today it mostly is), but I like to re-run it three or four times, burrowing deeper into the socio-economic background that informs its emergence—famines, bread riots, corruption, exploitation, social change, insecurity, the rise of a new working-class consciousness. There are surviving broadside ballads that tell the same story, and so I sing. I use images and musical turns to discover how disruptive they could be in the hands of a radical lanternist. Because the lantern was radical. Lanternists mocked the South Sea Bubble and romanticised the Highland rebellions and spread word of a rising Jacobinism. But modern performers, and much of its academic history, has pulled the teeth from the lantern. There is a very old current of working-class lantern culture that is still simmering somewhere inside it, that could be made to speak to a new era. In doing so we can understand a little bit about how the machines of the past felt living and powerful and vital to those that saw them. These things are not dead. A lecture with two lanterns at the National Science and Media Museum in Bradford. Credit: National Science and Media Museum. An improved Phantasmagoria Lantern and slide from the middle of the nineteenth century. Pull Devil, Pull Baker. The story of a crooked baker who is dragged to hell. I am a historian of technology. I work with Birmingham Museums and the National Science and Media Museum. Wednesday, 18 July 2018 What is a Magic Lantern Today?